Compared with 2009 CEE Greens seem set for a ‘mini boom’: they will double their EP representation with predicted one seat each in Hungary and Croatia and this time from genuinely Greenish parties: the Croatian Sustainable Development party (ORAH [= ‘walnut’]) of former environment minister (and ex-Social Democrat and noted social liberal) Mirela Holy and Hungary’s Politics Can Be Different (LMP) which despite a fractious existence as part of Hungary’s ineffective and divided left-liberal opposition seems, as in the April 2014 parliamentary election, set to squeak 5%. 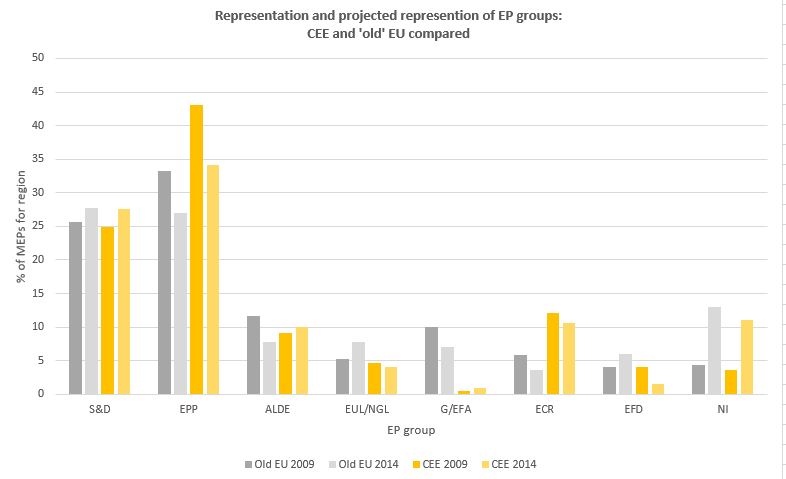 The bottom line is, while Green parties and activism exist (often quite vigorously) on the margins of CEE two decades after the fall of communism they still below (and usually way below) the 5-10% effective threshold needed to make in any numbers it even into the EP – even allowing for the smaller size of CEE states (median size of national delegation: 13 MEPs) compared to other EU states (21). Overall, viewed through the prism of East-West difference, the forecasts for upcoming European elections suggest not a political earthquake a basic continuity of long-standing patterns of difference in the party-political landscapes of the ‘old’ West and Southern European EU and the newer post-communist member states – but some surprisingly similarities in trends in support for different party groupings across the two regions of Europe. Seán Hanley is Senior Lecturer in Comparative Central and East European Politics at UCL-SSEES. He will be discussing the European elections in Central and Eastern Europe with Eric Gordy (UCL-SSEES), Roxana Mihaila (University of Sussex), Allan Sikk (UCL-SSEES) Aleks Szczerbiak (University of Sussex) at a roundtable event at UCL-SSEES on Monday 19 May, 5.30pm in room 431.